Антипремію «Золота малина» запідозрили у підтасовці результатів голосування. A voter who sent a PDF of all the voting tallies says they don’t seem to match the noms announced in a Jan. 20 press release. It’s not exactly Envelopegate, but people are beginning to wonder whether maybe the Razzies are fixed. This year’s nominees for the Golden Raspberry Awards — honoring the worst in cinema since 1981 — include turns by Amber Heard in London Fields and John Travolta in Gotti. But The Hollywood Reporter received an anonymous tip from a Razzie voter who sent a PDF of all the voting tallies, and the source alleges that the voting is suspicious. “The guy who runs the Razzies left the ballot results open after the voting ended,” says the source, who noticed that the “final” ballot contained movies and performances that did not receive enough votes to land in the top five of vote getters. “Cleary [co-founder] John Wilson just picks whatever he wants. Razzie voters are paying members who expect some sort of integrity in the voting process,” adds the source. The source handed over a copy of the ballot, dated Jan. 14, six days ahead of when final nominations were announced Jan. 20. For example, in the category of Worst Remake, Rip-Off or Sequel, Fifty Shades Freed received the most amount of votes, but that installment was not included among the nominees. The shark attack pic The Meg received enough votes for 11th place but is included among the top five nominees. In the Worst Actor category, Jamie Dornan (Fifty Shades Freed) and Kevin Spacey (Billionaire Boys Club) both got enough votes to be included but did not make the final cut and instead were replaced by Bruce Willis (Death Wish) and Johnny Depp (Sherlock Gnomes). Another voter voiced concerns in the Razzies’ own members discussion forum, blasting the organization and Wilson. “The nominations are fixed by a biased creep with a bitter political agenda who has no shame in stealing $25-40 from voters,” reads the post. In all, the organization has more than 1,000 members globally. 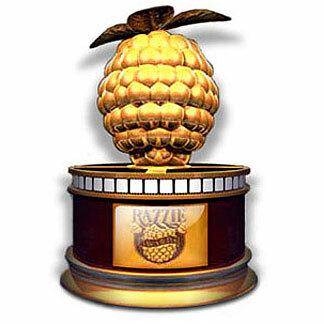 The Razzies, typically held the day before the Oscars, will be presented at a ceremony on Feb. 23.